Bouncy Bands make a great fidget for kids. - ADHD is a Super Power! These are used in schools. 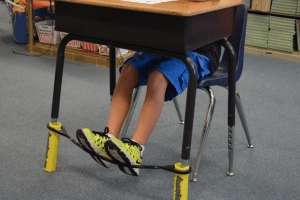 It provides some resistance for a bouncing foot. Genius! Why I think it’s genius? It allows the rhythmic motion of a body part. Sitting still and having the brain be active is difficult for me and probably for people with still developing frontal lobes…like kids up to young adults in their 20’s.